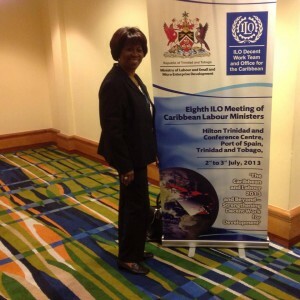 WILLEMSTAD - Ruthmilda Larmonie Cecilia was nominated by Pueblo Soberano (PS) as the new candidate for the portfolio of Minister of Social Development, Labor and Welfare (SOAW). This is according to several sources within the PS. The screening process is still going on, or is almost finished. The party leadership has not officially made any announcements yet, but it is expected that by the end of the week there will be more information about her nomination. Larmonie Cecilia is the Secretary of savings and credit organization ACU, vice president of the umbrella organization of credit unions Fekoskan, and worked as a lawyer at the Directorate of Legislation and Legal Affairs. She will succeed Jeanne-Marie Francisca, who was responsible for the SOAW portfolio, but was deposed early July of this year by a majority in Parliament. Since then minister Bernard 'Ben' Whiteman (Health, Environment and Nature) has been in charge of the portfolio.